Macon County was established by an act of the Alabama legislature on December 18, 1832, although the county did not exhibit its final and present-day boundaries until 1866. The county was created from territory acquired from the last cession of the Creek Indians on March 24, 1832, in the Treaty of Cusseta. Macon County is named for Nathaniel Macon, a distinguished soldier and U.S. senator from North Carolina. Most of Macon’s earliest settlers came from Tennessee, Kentucky, Virginia, and the Carolinas via the Old Federal Road, which connected Washington, D.C., to New Orleans. The Tallapoosa River and its lower tributaries run throughout Macon County and are home to 120 species of fish and 31 species of mussel. The Tuskegee National Forest consists of 11,000 acres of former farmland that was reforested and redeveloped for recreational use in the 1930s. According to 2016 Census estimates, the population of Macon County was 19,684. Of that total, 82.1 percent of respondents identified themselves as African American, 15.8 percent as white, 1.6 percent as Hispanic, 0.7 percent as two or more races, 0.3 percent as Native American, and 0.2 percent as Asian. 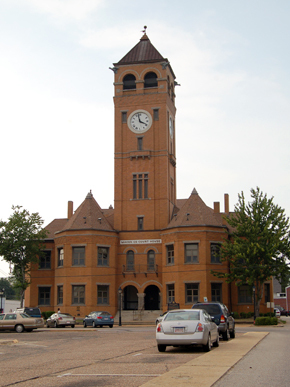 The county seat Tuskegee is Macon County’s largest city with an estimated population of 9,050. Other significant population centers are Notasulga and Shorter. Tuskegee is located in central Alabama, 40 miles east of Montgomery. Tuskegee is the county seat of Macon County and has an area of 15.7 square miles, 15.5 of which is land, and 0.2 of which is water. The land on which Tuskegee now stands was first settled soon after the French and Indian War of 1754-1763. The treaty officially ending the war declared that France would surrender Alabama to the English, who took control of the French fort at Tuskegee. After the American Revolution, the United States took possession of the area, which became part of the Mississippi Territory and in 1819 part of the state of Alabama. The settlement of Tuskegee was founded and laid out in 1833, one year after the establishment of Macon County by Gen. Thomas Simpson Woodward. Notasulga is located in north-central Macon County and southwestern Lee County in the east-central part of the state. Most of the town is located in Macon County. The name means “many teeth” in Muskogean, the language of the Creek Indians. It has a mayor/council form of government. Initially, the area that now encompasses Notasulga was named Moore’s Cross Roads. During the Civil War, Camp Watts, where conscripted soldiers trained and also had a supply depot and hospital, was located in Notasulga. The Creek Indians (Muscogee people) had long been cultivating lands in this area, producing crops of maize, squash and beans (the Three Sisters), and tobacco. Osceola (1804-1838), who became well-known as a leader of the Seminole people in Florida, was born to a Creek woman at Red Creek, 10 miles from the Tallapoosa River. He was of mixed race but identified as Creek. After the Creek were forced to cede their lands, European Americans developed the area for cotton cultivation. They depended on the labor of enslaved African Americans, many of whom were initially transported to this region from the Upper South in the domestic slave trade. Cotton continued as the chief commodity crop after the Civil War. Daniel P. Smith of Prattville, Alabama, served in Company K First Alabama Regiment during the Civil War. He wrote Three Years In The Confederate Service, a highly respected and informative account of the events during that three years. To read his mention of Macon County, Click Here.